At Custom Foodscaping, we transform ordinary spaces into beautiful, food-producing landscapes. We specialize in everything from food forests & herb gardens to profitable vegetables farms. We work with institutions including schools, universities, hospitals, community centers & restaurants. Let Custom Foodscaping help you build an edible schoolyard, chef's garden, permaculture orchard, or residential oasis. This is a great starting point for design work at your property. This service can stand alone as a verbal consultation or lead into a more extensive design or installation down the road. After reviewing your questionnaire and doing some remote research, I will visit your property with you (approximately 2-3 hours depending on property size) and provide as much design guidance as possible during that period, including a list of design ideas for you to implement. Valuable design direction during the consultation and a list of recommendations and resources. Flags marking the precise locations of place-based recommendations such as a tree or a rainwater catchment tank. Basic hand drawn map outlining key components or measurements of the site. Cost will be quoted at a $100/hour rate with a “not to exceed clause” after design request has been made. Let us do the dirty work!! First we prepare the site for planting the foodscape. Then we install the hardscape like pathway edging, trellises and protection for your new plants. Installation cost is based on plants & materials as well as labor. These costs will be quoted after design has been finalized. Our greatest joy is sharing our passion with others! We teach everything from individual classes to multi-day courses. Let us know how we can customize an educational program to suit your needs. In this class, participants will learn the best practices for germinating and growing successful baby plants. Getting new plants has never been so easy, in this class participants will learn the process of propagating new plants by division, layering, cuttings. Learn about the wide array of easy to grow fruiting trees and shrubs that will make your garden pop for decades to come. Learn how to transform your lawn into a functional food-producing garden. Are weeds driving you crazy? 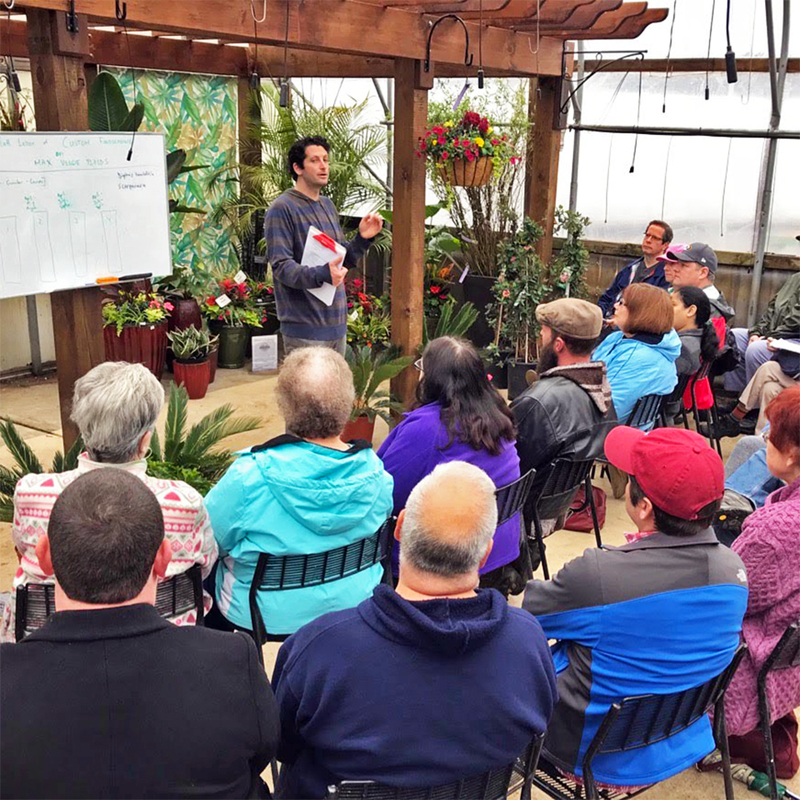 This class is full of tips on reducing the weeds your garden and increasing the bounty! In this class we will walk you though a few simple steps that will help you organize your garden space into the feng shui space you always dreamed of. Have Your Landscape & Eat It Too — In this class you'll learn about the plants and planting schemes that make it all possible. Growing mushrooms can be really easy—This class will give you the tools and resources to get started. Tillage is known to destroy the soil. In this class you'll tips and strategies so you'll never have to till again. Growing salad greens 365 days a year! Learn how to grow and harvest salad greens all your long. We'll talk about best varieties, overwintering greens, and season extension strategies. Participants will learn the basic science of composting and how you can get started building your best compost pile yet! In this class learn participants will learn how to make a bin for composting with worms at home as well as tips for successful compost management. This class will walk participants through the function and implementation of permaculture design principles. Exciting ways to ramp up your veggie production this season. This class will simplify one of the most daunting, yet important aspects of planning your garden. Learn about the best cover crops for the garden and how they can help you improve your soil. Get tips you need to be HARVESTING from the garden from March until December. This class will take a holistic approach to pest and disease management, with lots of tips on how to keep your garden healthy all season long.